We found a lonely bear at the park today. 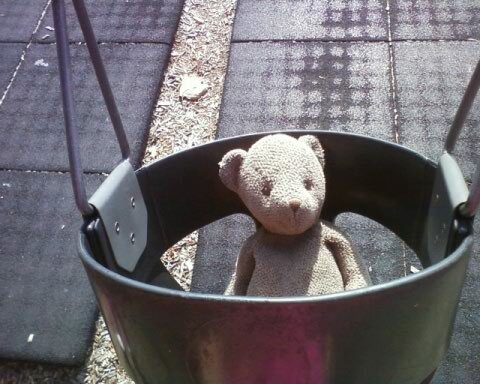 He was lying in the dirt, and I'm certain a child somewhere is missing him just as much as he is missing them. We decided to keep him company to cheer him up while he waits for his owner to come back and find him. 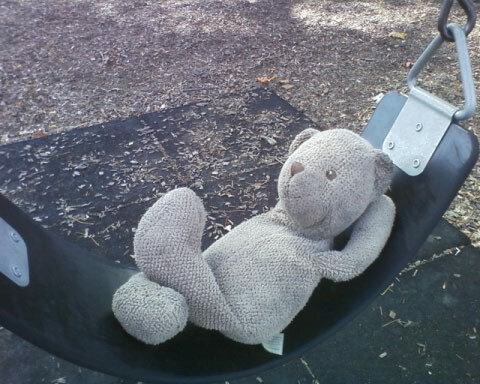 After brushing him off and introducing ourselves, we pushed him in the swing. He liked gentle pushes the best, but he's a brave little bear and let Abigail swing him super high - up, up in the sky. They both giggled when he flopped over and peeked at her through the leg hole of the seat. Seeing how brave he was on the swing, we decided to put him up at the tippy-top of the slide. 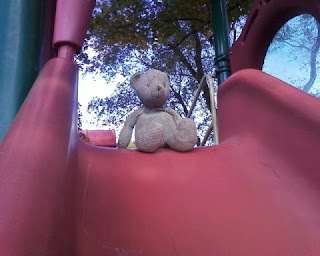 He is a brave little bear, but the slide was quite intimidating. He said the dirt at the bottom of the slide reminded him of lying on the ground before we found him. He enjoyed the view from the top. Little Bear was feeling happy about meeting new friends, but tired from all the excitement. He rested until we had to go home. 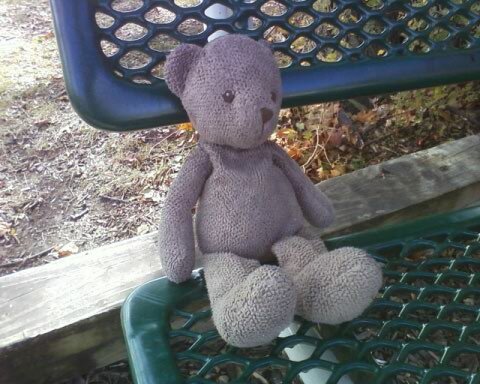 We didn't want little bear to fall from his hammock after we left, so we settled him onto the bench nearest the road, hoping that his owners will see him soon. Bye, bye, lonely little bear!